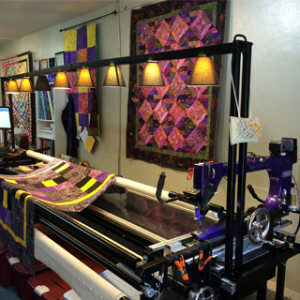 Our quilting is done on a Gammill Statler Stitcher which is a computerized long arm quilting machine. The throat size is 26”, so we are able to quilt patterns up to 21” high. If the occasion arises, we can also do some hand-guided quilting. We have a wide range of patterns from edge-to-edge, to blocks and borders. If we don’t have patterns that you like, we have catalogs that you can look through to find the perfect pattern. We also work closely with a pattern designer for any special needs. If you have not used our services yet, please read our recommendations below for what will make our job easier and complete your quilting in a timely fashion. Please bring in a backing that is 6” to 8” larger than the quilt top. For example, if your quilt top is 50” w x 60” h, your backing should measure 56-58” w x 66-68” h.
Please press your top and backing well. Poorly pressed seams sometimes lead to broken needles and/or holes made in quilt tops. If you have pressed the top and bottom and can bring them in on a hanger, it will help keep the pieces neat until we can quilt it. Please cut off the majority of loose thread from the front and back of the quilt top. Please check your quilt top for any open seams as they can cause the toe of the presser foot to catch and rip the quilt top. If we find a seam that is open while the quilt is on the machine, we will fix it if possible and charge you for the time. Please check the edges of the backing if you have pieced it to be sure the edges are even. If they are uneven, we will straighten them and there will be a charge. If you have any embellishments on the quilt top, please bring them to our attention when you bring in the quilt, so we can be prepared to quilt around them. If you have anything special about the quilt top or backing that we should know before quilting, such as a seam in the back should run vertical or horizontal, please let us know when you bring in your project. We are happy to trim your quilt when we finish quilting it at no cost to you. 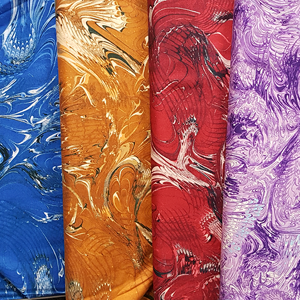 We carry a full line of Quilters Dream Batting and usually have the size you need in stock. If we don’t, we’ll order it for you in time to complete your project. Specialty threads available for $5.00. Custom: $0.0325 to $.0395/sq. in. Individual block designs or edge-to-edge design with up to one border design. Specialty threads available at no additional cost. Feathers, intricate block designs, quilting in the ditch, cross hatching, and two or more borders. We will be happy to show you samples and provide pricing. Machine sew binding, one side: $0.15/linear in. Machine sewn binding: $0.18/linear in. Hand sewn binding: $0.35/linear in.